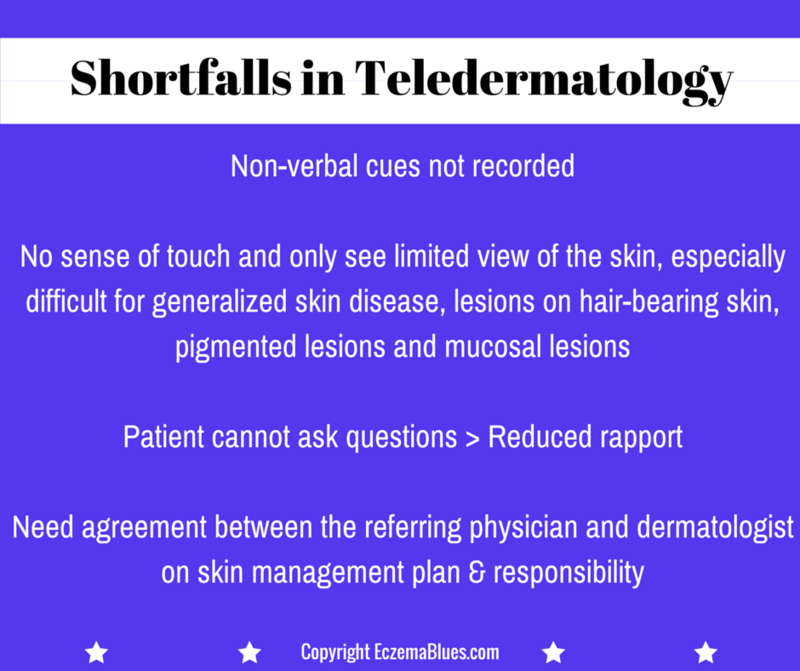 Last week we covered a critical part of the teledermatology process – getting quality patient information and skin images (for Store and Forward). This week we break down the various steps in teledermatology and explore why each step may not work as well as in-person consultation. Face to face consultation remain the gold standard as there are many areas where teledermatology may fall short. The referring provider and the dermatologist must be familiar and trained to conduct teleconsultation to mitigate these shortfalls. In face to face consultation, non-verbal cues can be noted including signs of stress that may be important in measuring the quality of life and severity of skin condition e.g. eczema. In triage teledermatology, it is often limited to paper documentation or standard referral letter. Mitigating factors – There should be a system in place at the referring physician clinic to understand the patient. For instance, comprehensive questionnaires, trained doctors and nurses to capture patient information and images and sufficient time to do so. The whole body has skin problems, for instance, generalized eczema rather than localized. Physicians have to note to treat the patient as a whole, even when the information is centered on the lesions (a potential pitfall of teledermatolgoy is focusing only on the skin lesion). The skin conditions are on areas of skin with hair that cover up the skin rash, for instance, the scalp. The skin lesions if pigmented are harder to view as an image. Mucosal lesions and orifices, e.g. genital, present difficulty to take accurate image. Mitigating factors – Skin images have to be taken from various angles, with mid close-up and macro close-up distance and skin lesions clearly marked. Therefore, the referring physician who takes the image or review the suitability of the image has to be trained. Special lighting or dermatoscopes may be required. It is more likely for the treatment to be carried out as prescribed if there is in-person interaction. Patients have an opportunity to ask their questions directly to the dermatologist and such interaction provide opportunity to optimize patient care. Mitigating factors – If the treatment is to be handled by the referring physician, educational materials may need to be provided for both the referring physician and the patient. There ought to be close communication between the referring physician and the dermatologist so that the treatment and skin management plan for the patient is agreed and both physicians feel confident with the plan. Patients with chronic inflammatory skin disease should be managed through teledermatology only if the referring clinician has the facilities and clinical experience to provide on-going patient support and review based on the skin care management plan provided by the reporting skin specialist. The rationale is that these skin conditions fluctuate significantly in severity and may require complex treatment plans for safe and effective long-term management. Patients (and parents/carer) should have access to suitable nursing expertise for treatment, counseling, education and advice. Another rationale is that these skin conditions may come with significant physical, social and psychological impairment and therefore the ability to provide on-going patient support is critical to patient care. There is a reported loss of rapport with the patient through the teledermatology. As such for certain skin conditions that are chronic, fluctuating and require long-term care, teledermatology may not be suitable. Next week, we will explore what are the advantages of teledermatology. Have you tried teledermatology? Did you feel at any time that your health and skin conditions are not fully understood? Was your referring physician convinced with the skin management plan and were you confident in following through with it? Share in the comments, especially important as teledermatology is gaining in popularity and we want to do our little part to steer it in the right direction for skin/eczema patients! Mom NeedyZz Cartoon – Clothes not Fitting anymore!